General insights and reviews on Benchmade Knives by BladeOps. The Triage by Benchmade has won a ton of awards. It is a great knife. 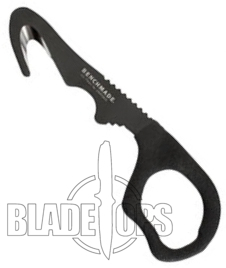 Built with rescue workers in mind, the Triage features a glass breaker, a secondary blade that is a seatbelt or strap cutter and then a main blade. On this newer variation of the Triage, the main blade features an opposing bevel. The 916 features a foreshortened tip. The idea is that you can then slide the blade point first under a tight spot without piercing skin. So if you are trying to rescue someone–you can a actually slide the blade into tight spots without hurting them. The first Triage is the 915 series, this new series is the 916. Both are available. Let me know which you like best. 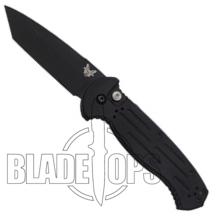 You can currently get the Benchmade AFO II knife in either a drop point or a tanto point blade. The drop point knives are the 9051 series and the tanto are the 9052. 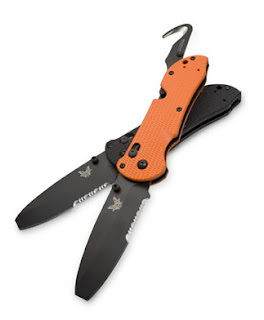 The AFO II is the second generation knife in one of the most popular series of automatic knives that Benchmade has produced. Built specifically for tactical situations, the AFO knife features a push button lock that is even stronger than the original. The knife blade is 154CM stainless steel and you can get it with a stonewash finish or with a black tactical BK1 coat. You can get either finish in a plain edge or combo edge. The AFO II features a black anodized 6061 T6 aluminum handle that is wide enough to get a nice solid grip on even if you are wearing tactical gloves. The button is easy to push and the blade triggers out quick and locks up tight. This is the perfect knife for those who serve in the armed forces–or for those who want a tactical combat knife for whatever life throws at them. Benchmade makes a fairly straightforward safety cutter. This tool is designed to cut yourself or others loose from a seatbelt or other strap that has you trapped. Built for one purpose only, the Benchmade Safety Cutter combines the best features of the 7 and 8 hooks. It is built from 440C premium stainless steel and is comfortable enough to hold–plus the jimping on the spine and in the finger choil closest to the closed loop give you tons of traction. This is the perfect tool to stash in your car. Carry one in each of your cars. At this price, they are a steal of a bargain. You can get it with any of three different color MOLLE compatible carrying pouches: black, ADC (grey), or coyote brown. The blade opening is .050″. Here is the video on the T-Rod. Great knife by Benchmade, sure to be a classic. Also, in case you didn’t know. Benchmade has a great program called Life Sharp. If you send your Benchmade knife back to them along with a small processing fee they will tune your knife up for you. This is a great video that describes the experience one of the guys in our office had with the Life Sharp program.